Nicaragua is the largest country on the Central American isthmus, bordered by Honduras to the north and Costa Rica to the south. With a main language of Spanish, it’s a hugely biodiverse and multicultural nation, with a population of 6 million. Gaining independence from Spain in 1821, it was first invaded in the early 16th Century when Christopher Columbus came ashore the Mosquito Coast on the Atlantic side, on his fourth voyage. From this, it is thought Nicaragua gets its name; Nicarao was the chieftain of a powerful indigenous tribe met by the Spanish colonists in 1522. Colonial architecture is, unsurprisingly, one of Nicaragua’s finest assets, found primarily in Granada. Boasting a superbly restored cathedral and majestic mansions with lush courtyards, this town is the nation’s best preserved colonial area, while Leon, a more working class city, is characterised by 300-year-old decrepit, yet picturesque, houses adorned with wonderful murals. Set between the Pacific Ocean and Caribbean Sea, Nicaragua has a broad selection of coastlines offering everything from glistening beaches, free from tourist developments, to numerous offshore islets, ideal for sailing enthusiasts, and sweeping coastal plains. Nicknamed the ‘land of lakes and volcanoes’, Nicaragua has equally diverse landscapes further inland and has an endless choice of outdoor activities. 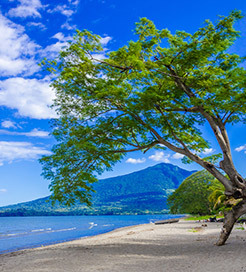 Lake Managua and the stratovolcano Momotombo, both just north of Managua, are the most iconic natural features, but you can also enjoy diving in underwater caves, surfing down active volcanoes and canoeing through alligator-filled wetlands. The capital, Managua, is a historically rich city lying on the southern shore of its namesake lake. Designed and shipped from Belgium in 1920, the main cathedral is now derelict and abandoned due to an earthquake in 1972, with all the original decorations and statues remaining inside; local authorities have recently begun renovations, however. Home to approximately a quarter of the population, it’s a bustling city giving you easy access to the nature reserve of Chocoyere-El Brujo, the nearby lagoons and the hot springs of El Trapiche. Traversing the Gulf of Fonesca a few times each week, ferries make the international journey from El Salvador to Nicaragua within two hours. This represents a more convenient mode of transport than flying or driving, offering superb views of the gulf’s stunning islets, pods of dolphins and mangrove-lined shores. For more information, please visit our Ferries from El Salvador to Nicaragua page.